Care2 Healthy Living | This Sauteed Cabbage Recipe Uses a Whole Head of Cabbage! This Sauteed Cabbage Recipe Uses a Whole Head of Cabbage! You bought a head cabbage last week. You swore you’d use it, but it still hasn’t made its way into any meals. This sauteed cabbage recipe is the answer! Lucky for you, cabbage lasts a long time in the fridge. It’s a hardy vegetable that had its heyday a few decades back and was popular for many, many moons prior. Don’t confuse cabbage with it’s doppelganger: iceberg lettuce. Cabbage contains an impressive nutrient profile. It boasts high levels of vitamin C (54 percent of RDI). And it contains 85 percent of your recommended daily intake of vitamin K. Let’s not forget folate, manganese, vitamin B6, calcium, and magnesium. Alongside this beautiful nutrient profile, cabbage’s antioxidants help to fight inflammation, which we can all use help with. 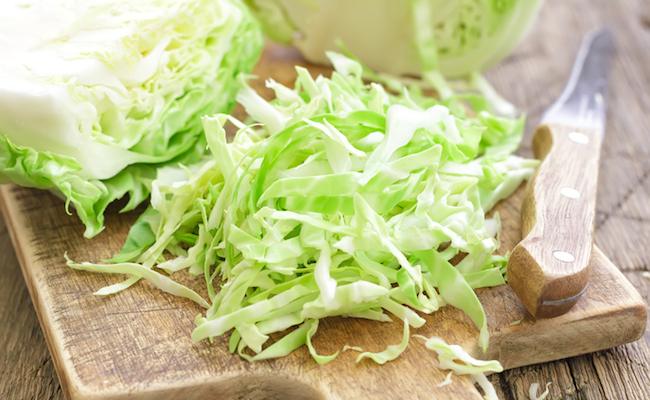 Plus, if you’re having a hard time getting your bowels to move, then cabbage provides the right amount of fiber to help you out. Lastly, your heart, blood pressure, and cholesterol levels love a good dose of cabbage. So what do you do with that whole head of cabbage you’ve got hiding at the back of the fridge? Try this super simple sauteed cabbage recipe. Combine the stir fry with some pan fried tofu and black rice for an easy, nutritious, and abundant meal (perfect for leftovers!). Wondering what to make with that whole head of cabbage? Sauteed cabbage to the rescue! Cut your head of cabbage in half. Then cut out the stem using a triangular cut. Once each half is de-stemmed, you can then cut the halves into slices. If you prefer smaller pieces, then cut the slices in half or into small squares. Heat a large pan (make sure it's large enough to hold all the cabbage) with oil on medium heat. Once the oil is warm, add the garlic. Stir briefly and then add the cabbage. Stir until most of the cabbage has been coated in some amount of oil. Then place a lid on top of the pan. This will help to steam the cabbage so it shrinks down in the pan faster. Stir occasionally. After about 15 minutes or so, the cabbage should appear wilted/cooked. Add the veganaise and the sriracha. Stir. Then add the salt and pepper to taste. Allow to saute for a minute or two longer. The cabbage is done when it's wilted. Adjust spice/cream to your desired taste. Prepare the cabbage with tofu and black rice as an easy weeknight meal. Sounds yummy in my tummy. TYFS!